Railway worker's son started as a gofer in a shirt store. With then wife Rosalia Mera, also now a billionaire, started making dressing gowns and lingerie in their living room. Business became one of world's most successful apparel manufacturers. Today Inditex has more than 4,000 stores in 71 countries. Sales: $12.3 billion. Ortega is chairman. Company exported its cheap chic Zara stores to four new markets last year: Ukraine, South Korea, Montenegro and Honduras. Stock up 1% in past 12 months, but fortune down because of weak euro. Also has personal investments in gas, tourism, banks and real estate. 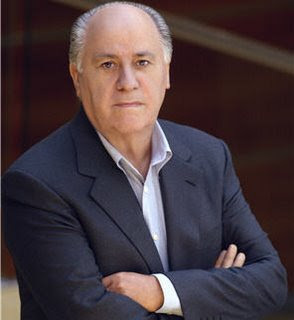 Owns properties in Madrid, Spain; Paris; London; and Lisbon, Portugal; plus a luxury hotel and apartment complex in Miami, a horse-jumping circuit and an interest in a soccer league. Shuns neckties and fanfare. Daughter Marta works for Inditex; recent speculation suggests she is being groomed to eventually replace her father.